The Interfaith Scholar Weekend Speaker for 2016 will beDr. Nikky-Guninder K. Singh, Professor of Religion at Colby College, Waterville, ME. 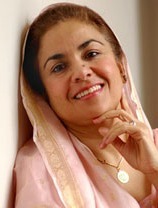 Her interests focus on poetics and feminist issues, and she has published extensively in the field of Sikhism, including The Feminine Principle in the Sikh Vision of the Transcendent (1993). Read more about Dr. Singh here.